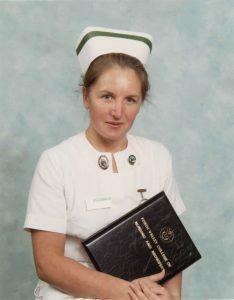 Today we look back 30 years, to the time when nurses could be immediately identified by their uniform and badges. This photograph is one of a small collection gifted to the Stirling Smith, together with nursing badges. 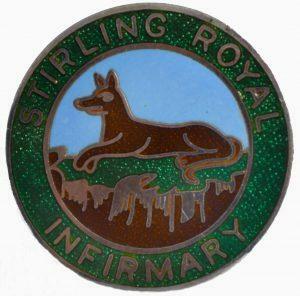 Nurse Sloan wears the green cap band of the State Enrolled Nurse and the purple and green Stirling Wolf badge of Stirling Royal Infirmary when she qualified in 1985. Jean Sloan joined the forces as a Royal Alexandra Nursing Student. As she did not complete her training, she later had to start from the beginning at Callander Park’s Forth Valley College. She worked in the Operating Theatre after qualifying, so rarely had the pleasure of wearing her badges at work, all of which are as new. Nursing has changed radically in the past few decades. In the army, nurses had to stand ‘at ease’ until the consultant had done his rounds. By contrast, life in one of SRI’s gynaecology wards was so informal, that a monkey was brought in from the Safari Park in 1989 to cheer up the patients. Nursing has always been a profession demanding strength and dedication. Nurse Sloan contributed a professional article to the Nursing Standard and was on duty when the Dunblane Tragedy struck 21 years ago.